India and Russia have begun their bilateral naval exercise, which is aimed at increasing interoperability between the two Navies and developing common understanding of procedures for maritime security operations. The six-day drill commenced off Visakhapatnam in the Bay of Bengal. The primary aim of the 8th edition of 'Indra Navy' exercise series is to increase interoperability between the two Navies and develop common understanding of procedures for maritime security operations, a naval release stated. The scope of 'Indra Navy 15' includes wide-ranging professional interactions during the Harbour phase and a diverse canvas of operational activities at sea across a spectrum of maritime operations, the release said. 'Indra Navy' is a bilateral maritime exercise between the Indian and Russian Navies and epitomises the strategic relationship between the two countries. Initiated in 2003, the drill has matured over the years with increasing scope, complexity of operations and level of participation. In addition, INS Sindhuvir submarine, the P8I long-range maritime patrol aircraft, Dornier short-range maritime patrol aircraft, Hawk advanced jet trainer and other integral rotary wing helicopters are also participating in the exercise. 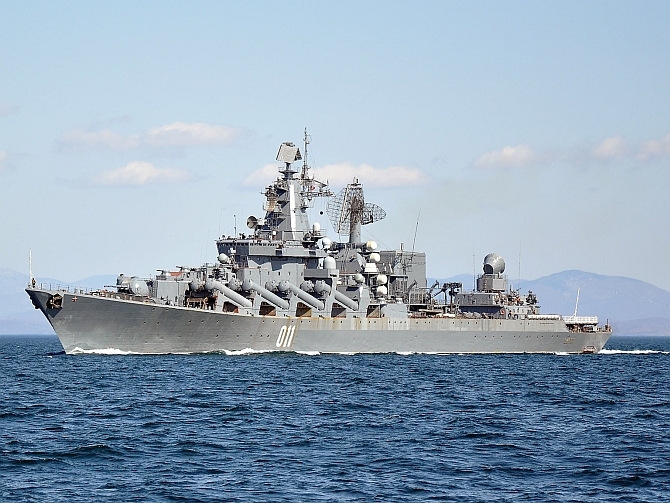 The Russian Federation Navy is being represented by Vadm Ryabukhin Andrey, deputy commander of the Pacific Fleet, and ships from the Pacific Fleet, based at Vladivostok. RFN ships Varyag (cruiser), Bystry (destroyer), Alatau (rescue ocean going tug) and Boris Butoma (fleet tanker) are also taking part in the operation. The exercise is being held in two phases -- the Harbour (Dec 7-9) and the Sea (Dec 10-12). The Harbour phase would encompass table-top exercises and planning conferences ashore, prior progressing to the Sea stage, which would include various facets of fleet operations. The drill is another milestone in strengthening maritime security cooperation between the two Navies and it also serves to reinforce the long-standing bond of friendship between India and Russia, the release added.